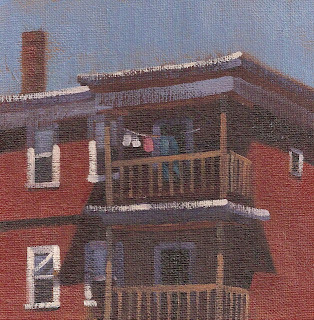 For some reason, hanging laundry has always been a popular theme for subject matter in many artists' paintings. Perhaps because it hearkens back to simpler times when electric clothes driers weren't available to average working class people. But it was the strong shadows cast across this brightly lit triple- decker in my hometown of Brockton, MA which caught my eye. Check out the new "Share It" button right above my picture in the right hand collum, please consider using it to share this on Facebook or Twitter . Help me reach 100,000 pageviews. Thanks and feel free to drop me an e-mail. I love checking your blog. Love all your city buildings and your writing. Keep up the great work. When the weather gets a little better we can go on a painting outing. Take care.